Trinity Proud To Support Buxton in Bloom Fundraiser! Trinity Fire & Security Systems were proud to support a recent ‘Buxton in Bloom’ fund raising event held at the Health & Safety Executive (HSE), Buxton. The event , arranged by Interserve (Facilities Management) Limited, was organised to raise funds for the Blythe House Hospice. 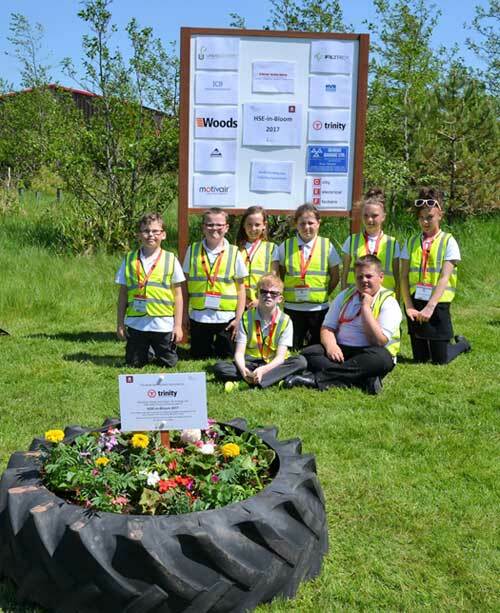 The project consisted of recycled tractor tyres, lots of plants, compost and some willing children from local schools who were more than happy to get their hands dirty! A total of 26 children and staff arrived from Peak Dale, Harper Hill & Burbage Primary Schools to help plant up the recycled tractor tyres and as the sun shined down the children were rewarded for their hard work with lunch and ice lollies. A grand total of £1100 was raised via the fund raising event and the new flower beds have now been entered in the ‘Buxton in Bloom’ competition which is due to be judged in the summer.